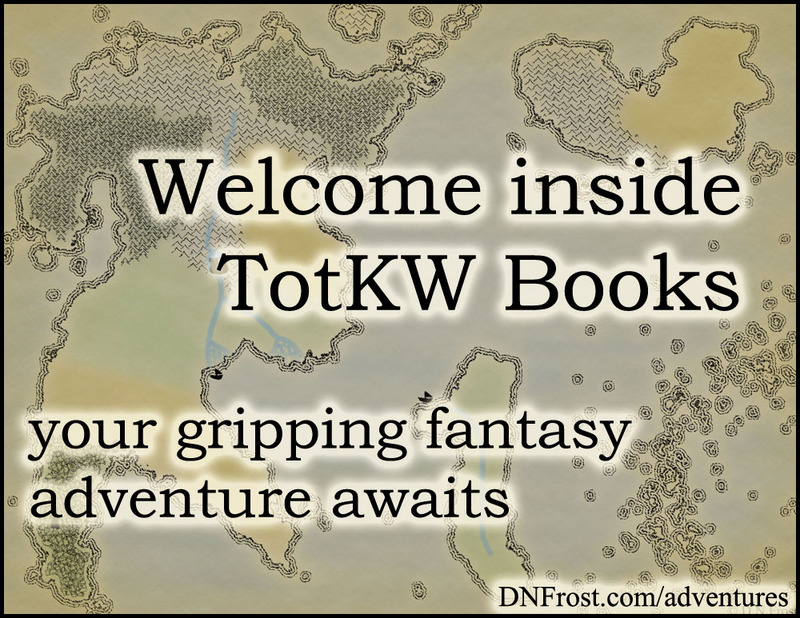 This post is Part 12 of a series to augment the Atlas of the Known World available for free download. Start with Part 1 here. The fallen civilization of the tree elves. You voted Old Ryerin winner of October 2015 by 48%. 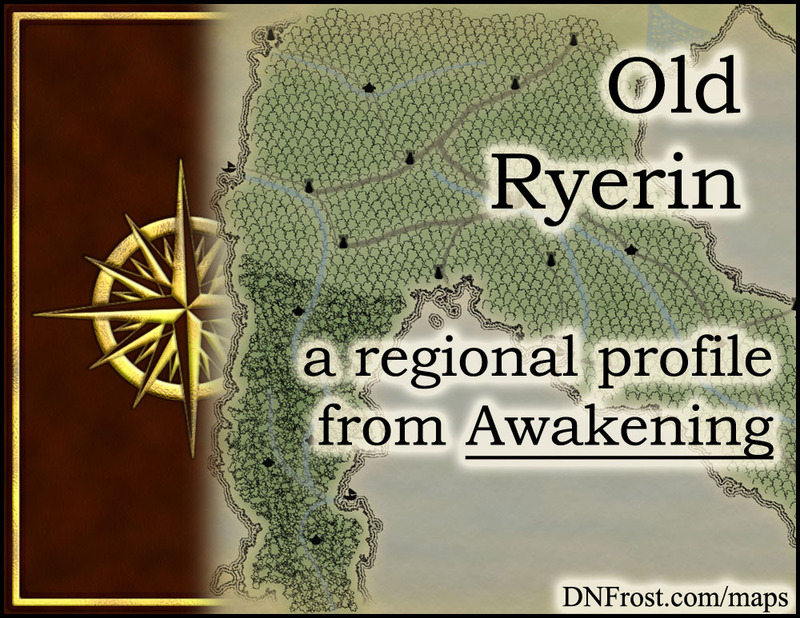 In Part 3 of Awakening, Old Ryerin is a lost forest that stood in what is now the badlands. A mighty civilization once reigned between the Glades of Despair and the Front Rishi, before dark fire reduced the trees to charcoal. Ample coastlines made for bustling trade with Ryerin's neighbors, and the moisture from sea breezes fostered rainy, temperate seasons. This region also bordered the Gulf of Lohki, Desperate Sea, and Plains of Rishi. The old growth forests of Ryerin were rife with grand oaks and king beech trees that towered over 150 feet high. Stands of elven birch grew in the sandy soil near the coasts, and a thriving ecosystem of birds and woodland creatures dwelt within the trees. The mightiest of all Ryerin's birds was the great phoenix, whose airspeed and glorious plumage earned it the name fire falcon. In addition, its ability to regenerate damaged or lost limbs gave rise to the name resurrection eagle. Now extinct like the rest of Old Ryerin's creatures, the wild phoenix was known to hunt in bands of five or six members, using stealth and strategy to take down deer and wild boar. The tree elves of Old Ryerin built a mighty civilization within their forest, but they fled northward when Ryerin burned. Now they live as second-class citizens in the Plains of Rishi, scratching out an indentured living beneath the wealthy plains elves whose ancestors offered Ryerin's refugees the chance to earn their keep. The fairest of all the elves, tree elves have light hair and light eyes. Like all elves, they are tall and graceful, and like most of the elf races, they have long backswept ears. The tree elves of Old Ryerin were strongly allied with the flourishing civilization of nymphs to the south, and loosely allied with the rural agrarian culture of plains elves to the north. Both men and women tended to dress in white robes, though colorful trim was often used to symbolize financial status, guild membership, and individual preference. Like most of the elf races, tree elves make poor elemental mages. They display good sensory magics, with their Sound magic comparable to that of plains elves, though their latent Touch magic is typically less prevalent than in their plains elf cousins. Both their prime Metal magic and their latent Animal magic are quite good, and though there are few stellar Metal mages amongst the tree elves, their special magics as a whole are more balanced than other elf races. This balance gives rise to a greater prevalence of rare Forge mages, who can sharpen and sculpt cold metal as if it were clay. The tree elves of Old Ryerin valued justice and equality over all other virtues. Model citizens were fair and indiscriminate in their affairs, regardless of their financial standing. The meritocracy of Old Ryerin sought out the smartest and most capable for positions of power, and even the king was appointed by an electorate of Ryerin's most virtuous scholars. Magic and education went hand in hand, and Ryerin's universities were renowned throughout the Known World for their accessibility and stellar curricula. Families were large and egalitarian, tracing lineage through both the male and female lines, and important family decisions were usually determined by the vote of parents and children, as well as extended family such as grandparents, aunts and uncles, and even cousins. Every voice was considered equally important, and it was most offensive to dismiss a Ryeri's opinion without giving it due consideration. Age was measured in years, and Ryerin placed the new year on the winter solstice as per the solunar calendar of the ancient merfolk. The line between childhood and adulthood was very blurred for the Ryeri, and overall maturity was usually the deciding factor in how a person was viewed. Articulate and compassionate individuals were often considered adults early in life, while recalcitrant or spiteful personalities were viewed as children well into their thirties. The mark of adulthood was measured in how an individual treated others, particularly those who could offer nothing in return. While no celebration marked a child's ascension into adulthood, weddings were a huge affair in Old Ryerin. Wedding preparations often took years to perfect, and the wedding itself often spanned a week or more of drinking, feasting, and music interspersed with grand speeches and gift presentations from family members and well-wishers. Though Old Ryerin had little cause for war, highly-trained phoenix gliders were considered the guardians of the forest. These riders were respected throughout Ryerin, and they were often given special consideration out of appreciation for their guardianship. Aspiring youths would report to one of the land's many aeries, and each selected a phoenix chick from the hatchery there. Life in the aerie consisted of combat training and care for one's phoenix, as well as mandatory schooling to ensure a balanced education for each rider. Adult phoenix gliders also learned aerial maneuvers and battle tactics, as well as the overarching strategies of war. The oldest riders retired from active duty to teach the youths of the aerie, and at a rider's death, the aerie released his longer-lived phoenix back into the forest. Unfortunately, phoenixes are now extinct, and the tradition of phoenix gliding died with them. The tree elves of Old Ryerin spoke a language known as Ryehren, which was a dialect of the mer language that was was heavily influenced by A'lari, the language of the nymphs to the south. Strangely, the tree elves are the only one of the elf races whose tongue is not based on Ka'e, the ancestral language of the elves. However, the high civilization of Ryerin escalated their language to the lingua franca of its day, and people across the Known World learned Ryehren in order to trade and conduct foreign policy. The language Ryehren was written in a curving script similar to that of the mers, and it was the first "universal" tongue of the Known World, though most outside of Ryerin spoke their ancestral tongue natively and learned Ryehren as a second language. 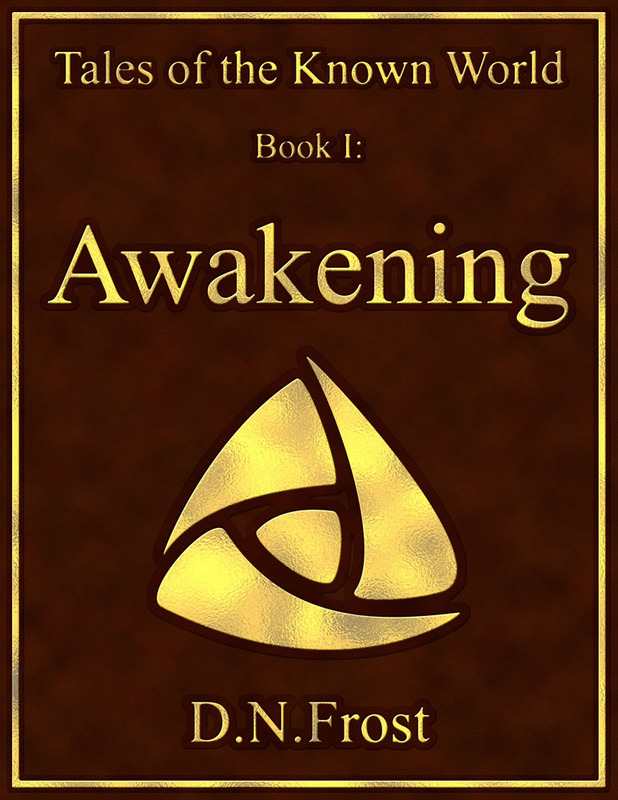 In the book Awakening, Kingard is a plains elf who lived in Old Ryerin until it was cursed by the invading Colkh'rak. After helping citizens flee northward, Kingard witnessed the rapid decay of his beloved home into the arid desolation of the badlands. Now, he leads a company of fugitives around the badlands and into the Glades of Despair, where the mythic city A'lara awaits their arrival. With little more than luck on his side, Kingard hopes to reach the magic city and unleash the power to oust the Colkh'rak once and for all.